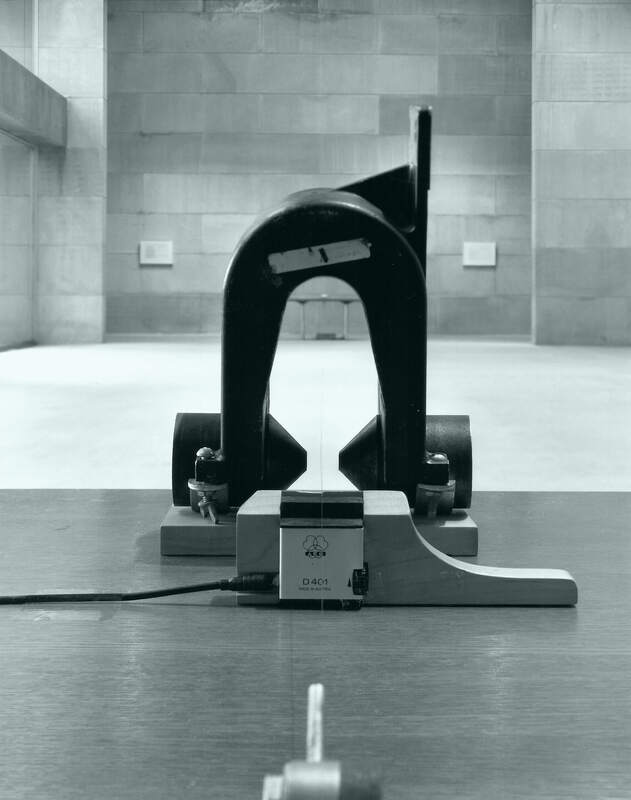 John Baccigaluppi’s 2008 AES Surf Report | Tape Op Magazine | Longform candid interviews with music producers and audio engineers covering mixing, mastering, recording and music production. I'm posting this for John as he's finishing up the next issue of Tape Op. 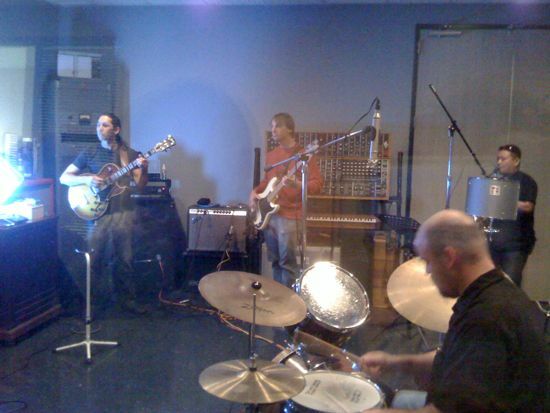 -LC John Baccigaluppi’s 2008 AES Surf Report This year’s AES show in San Francisco was a lot of fun. The day before the show, I drove with our UK publisher Al Lawson and his wife Nadia to Pacifica, a small coastal city just south of San Francisco. The surf was good, consistent waist to chest high, glassy and not very crowded. I got some good waves on my 6’ 8” twin fin fish I’m still trying to figure out. I think I like that board. Friday night after the show, Larry, Andy, Laura and Count (Tape Op 59) went to see Sigur Rós at the Greek Theatre in Berkeley. The Greek is one of my favorite places to see a band and this show was great. The forecast was for rain all night, so we had our raincoats but were hoping for the best. I figured a little bit of rain would suit this Icelandic band’s music, but being drenched would be a drag. I saw Radiohead here a few years ago and fog was drifting in and out throughout the evening adding to the vibe an already great show. The weather is definitely part of the experience at The Greek. The rain held off until the last song of their encore, when it began to drizzle lightly. The louder the song got, the harder it rained, until at the peak water was pouring off the big awning over the stage. As the band left the stage, the rain let up to a light drizzle that lasted the rest of the evening. Amazing band, amazing show, good timing with the rain. 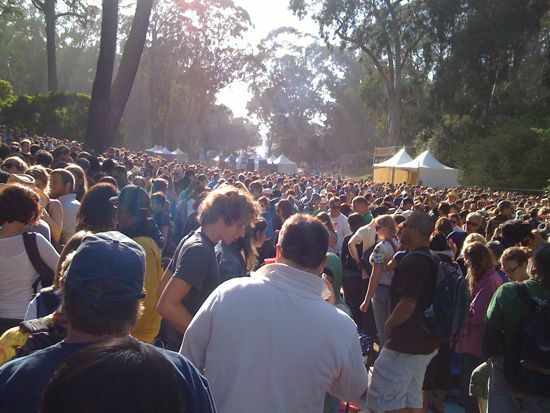 On Sunday, I managed to leave the show early to get out to see part of the Hardly Strictly Bluegrass Festival that was going on all weekend in Golden Gate Park. Will Oldham, aka Bonnie Prince Billy, Elvis Costello and Iron and Wine were all playing within a three hour block on Sunday afternoon. I got there and found the stage Will Oldham was playing about 10 minutes before he went on. The place was packed and the security tried to send me to the back, but I talked them into letting me stand in the last available square foot which was about row seven. 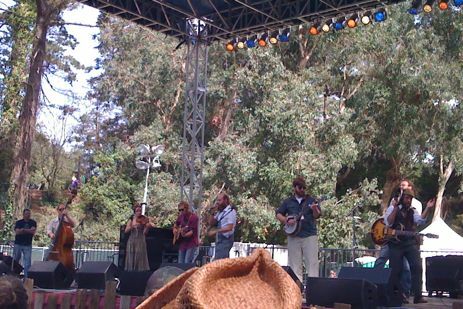 His set was great with a seven-piece bluegrass band. You could tell they were having a great time being at the festival and on stage. The line for the porta-potties was about 200 people long, so by the time I got out of there I’d missed the beginning of Elvis Costello on the main stage. It was so packed, the closest I could get was about 100 yards from the stage. It sounded great, but I realized that if I wanted to see Iron and Wine, which I did, I needed to get back to the previous stage. I got there as Greg Brown was finishing up his set, and it took me nearly 15 minutes to slowly make my way through the crowd back to the front of the stage. Somehow I was able to reclaim my small piece of grass and was right up front again. 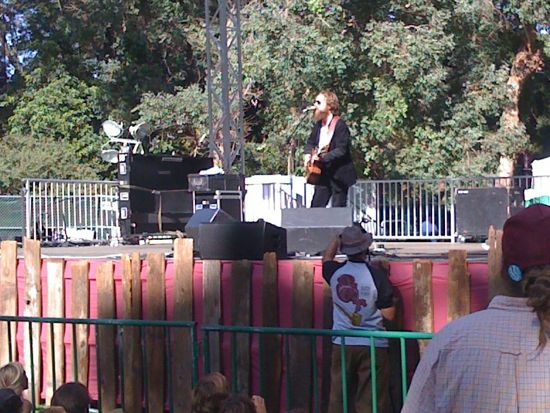 Iron and Wine (a.k.a. Sam Beam) is one of my favorite musicians and his set was amazing. Just him solo, and again, obviously really enjoying himself. The crowd was super into it and as far as you could see back there was a sea of people. 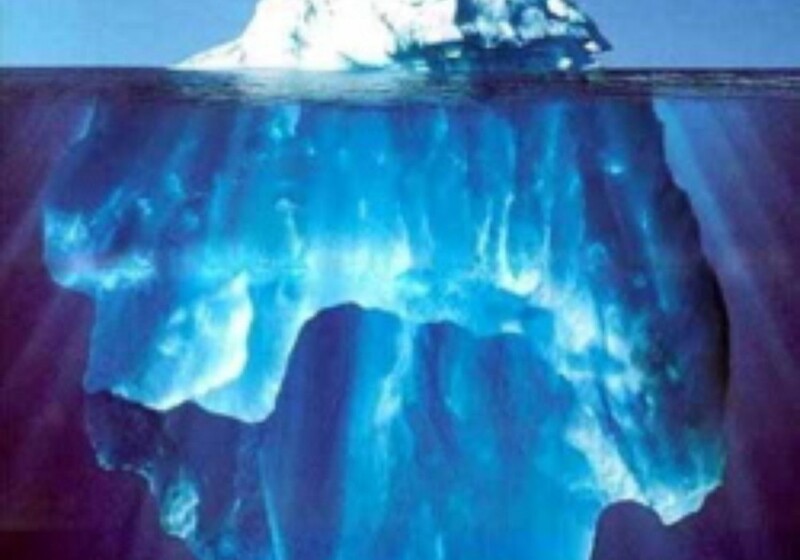 The stage was in a natural gully, about 50 feet deep and both sides of the hill and behind the stage was lined with solid people. There were even people in the trees! Joints were rolled and passed and the show definitely had a San Francisco vibe. I forgot to mention that the entire show was free! Some wealthy software engineer pays for the whole thing every year. On Monday, we went to Santa Cruz to visit Universal Audio. 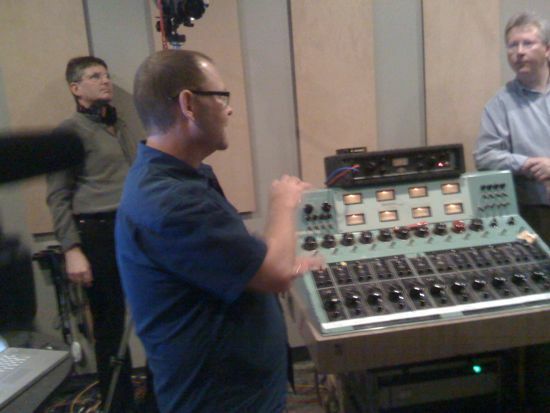 Here's Bill Putnam Jr. with the vintage 610 console. 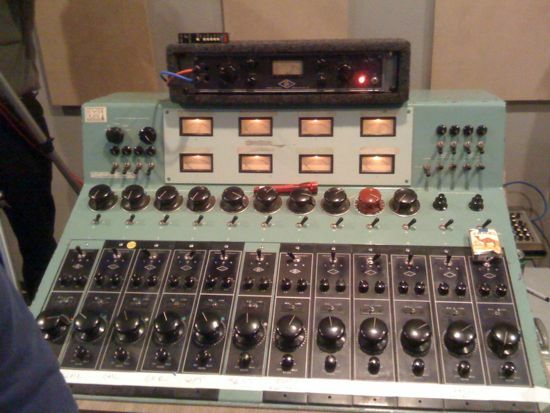 Neil Young’s engineer John Nowland drove up Neil’s 610 console up and Will Shanks of UA was recording the UA house band. See Will's report here. The band and the console sounded amazing and I got to play around with it, muting things, and changing levels a bit to hear the different mics being tracked live to two-track. 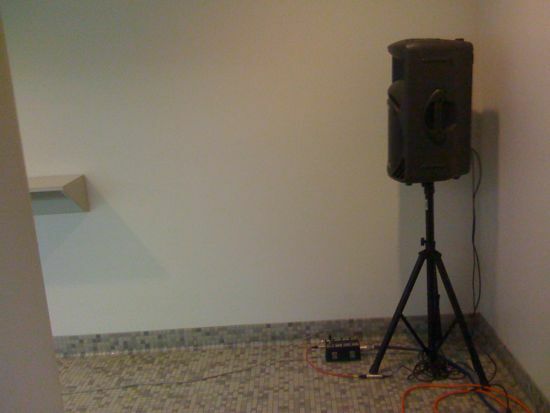 There was even a speaker/mic combo in the bathroom for reverb. Later that day I surfed some solid chest to head high waves with my friend George Samuel and Tom Der from Soundcraft, who drove down from the show to catch some waves. Definitely one of the better AES shows in a while! -John B.